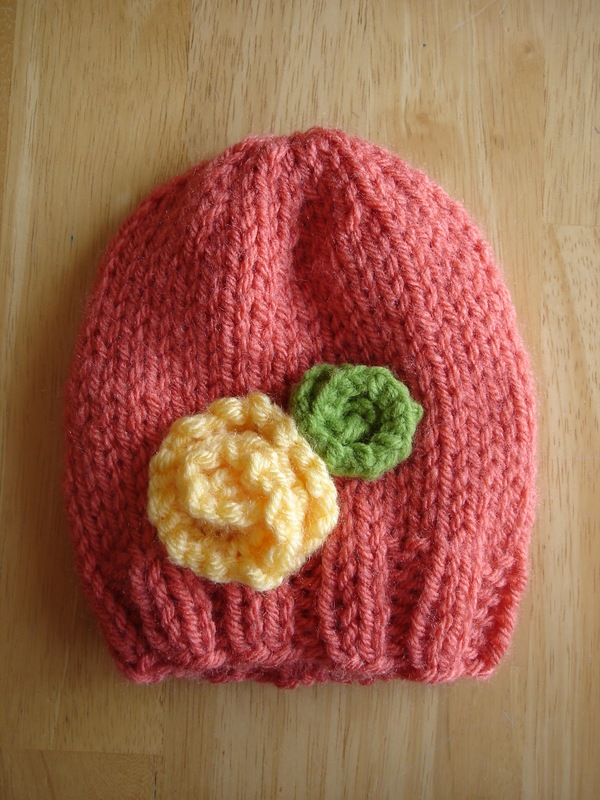 Baby in Bloom is the ultimate all purpose baby hat pattern. Knitted in fresh springy colors, with a simple knitted flower or two, they make lovely gifts for babies of all ages. 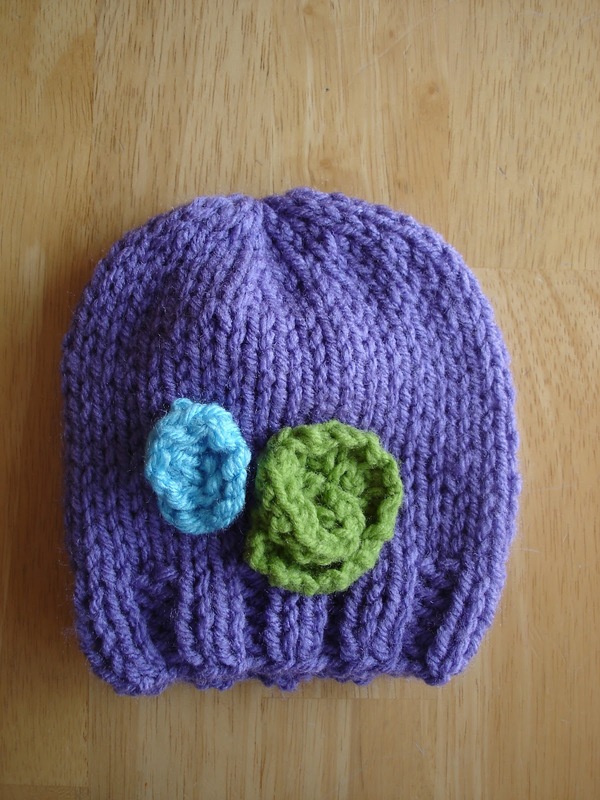 Knitting one in each size for baby's first year makes a thoughtful baby shower gift too! 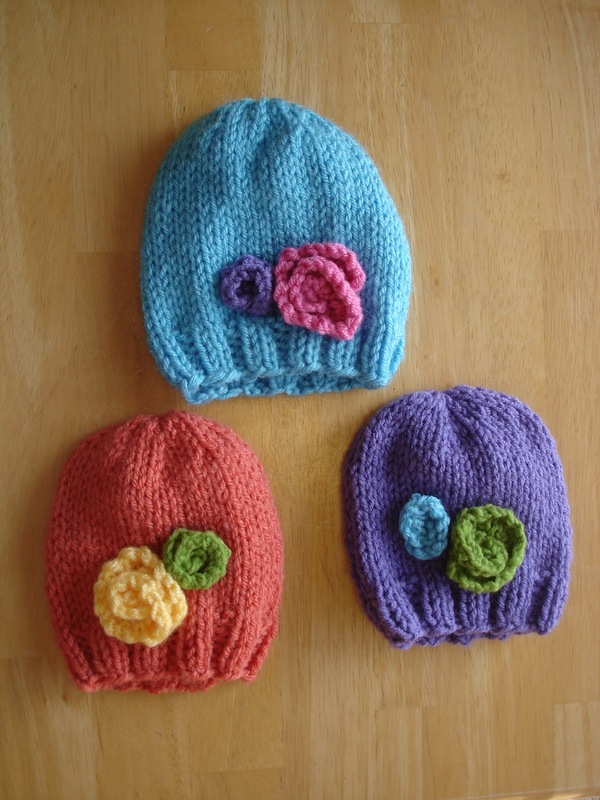 Hats shown with blooms, but easily customizable with more or less blooms, or no bloom if knitting for a baby boy. Worked quickly with US 10.5 needles, this pattern is great for charity knitting too! Picture examples shown here are knit with worsted weight yarn, but feel free to experiment with other yarn weights or luxury yarns for gift giving. 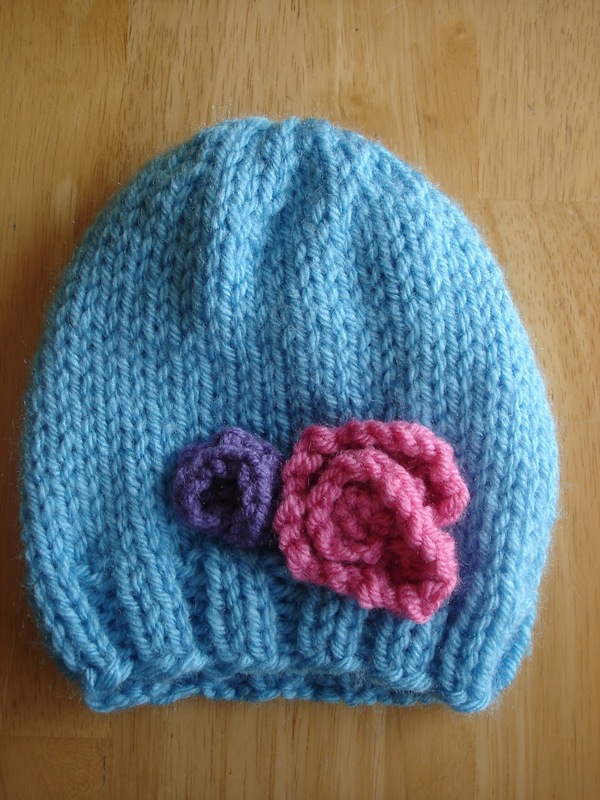 Pattern includes instructions for hat, large bloom and small bloom, and includes directions for both knitting in the round and for knitting flat. *Note: Hat is very stretchy and fits a variety of heads, but be sure to check head circumference first to ensure best fit. CO - Cast On (I used the long tail cast on and left an extra long tail for seaming up later for the flat version. Switch to stockinette until hat measures 5 (6, 6.5) inches from CO edge. Using tapestry needle, break yarn leaving a long tail. Thread through remaining stitches and pull tightly. Seam up the back and weave in ends. Switch to stockinette (knit all rows) until hat measures 5 (6, 6.5) inches from CO edge. Using tapestry needle, break yarn leaving a long tail. Thread through remaining stitches, pull tightly, and weave in ends. BO and attach to hat. Hello! I love your hats! I made one of these for my niece and everyone loves it. how many stitches would you suggest for a 5 year old? I tried 88 it was too many would 65 or 75 be too many? thank you for this site you have really inspired me! Thank you, you are so very kind! For a five year old, I would try casting 72 stitches...then decrease as indicated in the pattern. Hope that helps! Happy knitting to you!!! awesome thank you!!! i already made my second one everyone loves them and I give all the credit to you! SOUNDS LIKE IT WOULD MAKE AS CUTE CHRISTMAS GIFT! Have you tried this hat for adults? what would you cast on? I haven't done this for adults yet...I'll have to see, stay tuned! Stockinette stitch flat: Knit one row, purl one row, repeat until desired length. I tried printing this using the 'Print' button at top. So far it's about 15 pages of mostly blank pages (10-15 pages blank except for the title of the pattern at the top of the page and the url at the bottom. ), comments and ads before I get to the pattern. The actual pattern only took 6 out of 15 pages, so the rest was wasted paper and ink, imho. Is there a way to 'save' just the pattern to pdf, so that I don't waste all that ink and paper printing out the 'extra' that I don't need? I tried to cut and paste it and that didn't work either. I like the pattern but wanted to save it to my hard drive for later. Too many UFOs right now. I wanted to do it later when I have finished some of my unfinished projects. An easy way to print only what you need is to just highlight needed text, click the right mouse button and select copy, and then paste it to a blank word document. That way you can print only what you need and save it on your computer too. I did the same thing! Please make your article more priter friendly! As most things that have a print pg on the top that is all it prints! Try doing what I suggested for Gloria in the above comment...that should help. Just ask it to print page 1-6 or how many pages the pattern covers, all I need was pages 1-4 for the pattern. Hello! LOVE the hats!! My question, as I am new to knitting- what is the name of the yarn that you used? Thank you so much! When I knit for charity (where the hats get sterilized) or new babies (who have tired mommies who don't want to hand wash anything)...I always use an easy to wash yarn...for these I used Vanna's Choice Baby, and I think maybe Red Heart Solids for one or two...the flower is not so important because it won't be against baby's head, but the two yarns I mentioned are surprisingly soft when washed. Which string did you use to seam up the hat? The cast on string or the top of the hat string? And, if you didn't use the cast on string did you simply weave it into the ribbed portion of the hat? Thanks in advance! An easy way to seam up the hat is to leave a long tail when casting on your stitches...that way you can use it to seam up the back of the hat later. If you don't have a long enough tail you could always just tie a piece of yarn on and sew it up that way. Either way would work. Then just weave in any loose ends. Good luck! I am having a horrible time trying to KFB . . . , please help! My grandaughter was born on the 16th of this month and I am knitting her a hat for the warmer weather. The hat is finished, but I can't figure out how to knit front back. Thanks! I LOVE LOVE LOVE the hat! Just put a post today just for you on how to KFB (knit into the front and back of a stitch)...it is a photo tutorial, so hope it helps! Happy knitting to you and congratulations on your granddaughter!!!! Thank you for a wonderful pattern. I started out with a flat hat, but did not like how the seam looked...so I taught myself, with the help of you tube, to knit in the round. I found your instructions extremely clear. I have made 6 hats in the last 4 days. Love them! Thanks again for your adorable pattern! You are so welcome! Wow, you've been busy, so exciting too that you've learned to knit in the round too! I just found your pattern on pinterest and am excited to try it for my granddaughter. Thanks for a great pattern!! Thanks! Your granddaughter will love it! This is a fantastic pattern! I was just wondering if the decrease is supposed to be the same for all three sizes. Does it just gather more on the toddler size opposed to the newborn size? Yes, the decrease it still the same for all of the sizes. It would gather just a bit more...to see an example, check out another pattern of mine called the "Cotton Candy Toddler Hat" It has a similar decrease and is toddler sized so you can see what it looks like. It uses a different needle size, but still a similar decrease and overall look. The pattern is in the "Free Knitting Patterns" tab at the top. Hope that helps!!! Hi I was wondering are you using a single strand to knit or two held together? Thanks for the pattern! Sounds lovely, what a special person you are to give of your time so lovingly. The world needs more people like you!!! My suggestion for copying any pattern with other artwork on page is to highlight and copy, then paste onto notepad - that will only pick up the text and not everything else. Then you can paste that into a word document and go back and copy picture of item for reference. Hope it works for you. I really enjoyed knitting these little hats. 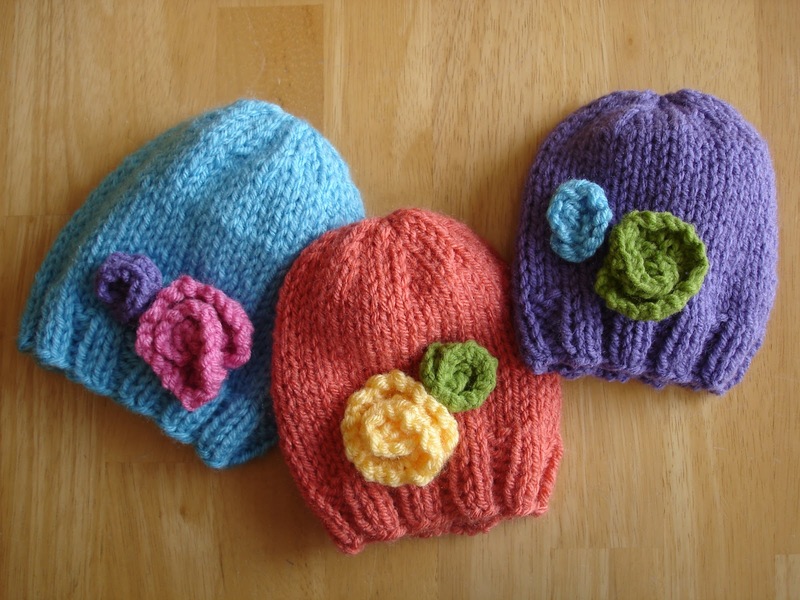 I used a smaller gage and made some cute premie hats and wrote about the pattern on my blog! Thank you Missy, they are very cute! I noticed you mentioned that they are a little small, perhaps going up to the 10.5 needle size might help? Hi, I was wondering if this pattern would work with the new soft chunky yarns? That sounds like it would be very pretty! I would recommend doing a little swatch with that yarn to be sure it looks how you want it to look and that you're getting gauge. I found bamboo knitting needles at a knitting shop brand name KA (Kinki Amibari)and they make a circular needle that is only 9 inches. A friend bought it but found it too frustrating to use so she has loaned it to me. While it does take a bit of patience I love it for making small baby hats that require a circular needle as I had the problem that others have found, not enough stitches to go around a 16 inch circular. Maybe someday I will learn the magic loop method but for now this works for me. I teach knitting to a class of 5th graders. This is such a simple but CUTE CUTE hat, they're ready to knit up a bunch. The flowers add the just right touch to express themselves with interesting colors. Thanks so much for sharing this pattern! I found some 12 inch circulars and they are perfect for these small hats. I make them for our local hospital and that is all I use with dpn to finish. I love those too! They make it so much faster and less fiddly. They are kind of hard to find though, usually I can only find the 16 inch size. I am trying to make these and I cannot get my gauge to come out 14 stitches only make 3 in. wide with both the 10.5 and 11 needles. What is wrong? Thanks for your question! Are you using the same/similar yarn? Sometimes that makes a big difference. Tension can sometimes make differences in gauge...I would keep experimenting with different sized needles until it comes out the size you need. Good luck! Wait... i am confused. how do you get a flat piece into a hat? Hi Sacia! You can knit a hat flat and seam up the back when you are finished. In knitting the flat version, when doing row 5 of the decrease, there is an odd number of stitches, so I am unable to knit 2 together across the row. is it just me? i undid my work and redid it but ended up with the same result. Not sure why it's not working for me. Before the decrease, I have 48 st on my needle. After the R1 of the decrease, I get 25 and after R3 I get 13, so i end up with 13 stitches in R5. Does that make sense? I'm not sure where i messed up. This hat is adorable! I knit the flat version and have no difficulties finishing the project (seaming at the back of the hat). The measurements given for the mid-sized hat are accurate. I have already made two of them for my granddaughter and she looks so cute in them. Thank you for the post, Jennifer. You are very welcome, and thank you for your kind comment! Apologies for the possible silly question, I really am a beginner and need it in layman's terms. I am from UK, are sizes etc different to US? I know they are when using crochet patterns? Hi! I'm so looking forward to knitting some of these sweet hats. Thank you for posting the pattern! I have a silly question though, as I'm a super beginner and new to knitting in the round: what size does the length of cord have to be for the circular needles? Will the 10.5 with a 16" work for the toddler size hat? Thanks for your help, and thanks again for the pattern! a 16" inch circular should be fine, happy knitting! Hi, beautiful easy pattern. My daughter is a Labor and Delivery Nurse and asked me to make some baby hats as they were running short and donations have been lacking lately....I came across this pattern one afternoon and made the first five, I love your pattern, I used both methods. The flowers are the just the right finish for baby girls, and add some color bands for the baby boys! Thank you so much for the pattern. Would love to make this hat for an 18" doll. Can you give suggestions for number of stitches to cast on and any other necessary changes? I was wondering if you could make a way to print this pattern without having it print the entire website and pictures. Like a pdf or something so I can give it to my church friends. We make hats for parents who have lost their baby and want something to remember them by. Thanks. I just started knitting this hat for a 5 yr.old. Doing it as a surprise so can't measure her head. Was wondering if 72 cast on stitiches is correct? It does seem so large. I did check my gauge and is right on. When using circular needles for this pattern,do you also need double pointed needles? When using circular needles for this pattern,do you need double pointed needles too? Is it possible to have the stitch count for co for a preemie? Thanks you for your generous gift of this free pattern. HI I'm a bit of a beginner in my skills. When it came to choosing circular needles I wasn't sure what "length" of string I needed between the needles because it wasn't indicated in the pattern :(. What size do you use? Are the flowers done on straight, circular or double pointed needles? i rarely have a need for a baby hat as i live in a very tropical country!! LOL! however, my niece moved to Buenos Aires with her husband and recently had a baby girl.... and since they are just now going into winter, she needs a baby hat....and i am so glad i found your pattern...it is cute, easy to make and if i make the toddler size, she can probably use it next winter too. thank you so much for such a cute pattern. As its says BO [break off] how do you take the loops of the needle to make them in to the flower? Do you cast off, thread the wool and gather the loops? Which one?